This week's menu plan comes with a twist. 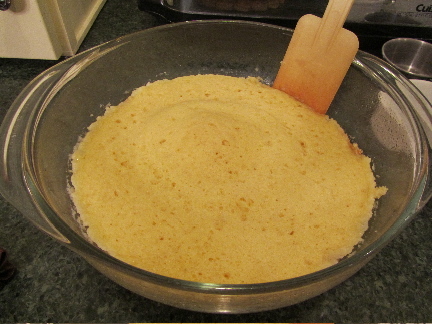 At the bottom is a recipe for microwave sponge pudding. Specifically, this recipe comes from Diane in the UK, and was left in the comments section for anexactinglife on the post The Valentine Dog. 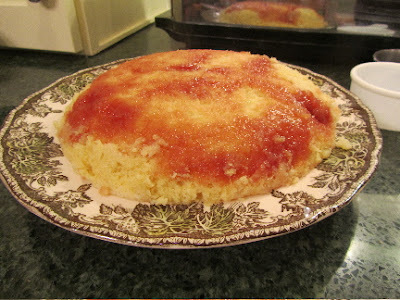 So, anexactinglife, scroll down to the bottom of this post, and you'll find a recipe for an easier version of steamed pudding, to satisfy your husband's yearnings for foods cooked from his UK childhood. I'm still planning family favorites for winter evenings. Hot sandwiches are always popular, and soup makes a warming entree, when you tuck your feet under the table in late January. I'm still using up turkey and ham from the freezer, as well as a lot of frozen fruit from the summer. My goal is to empty the smallest freezer by the end of January, so that I can unplug that one. I'm almost there. I have 1 whole turkey still to roast, and a few chunks of beef. I'll be looking for poultry and beef on sale in the next few weeks. This is a quick, microwaveable version of a steamed pudding. From Diane, posted in the comments section of The Valentine Dog. 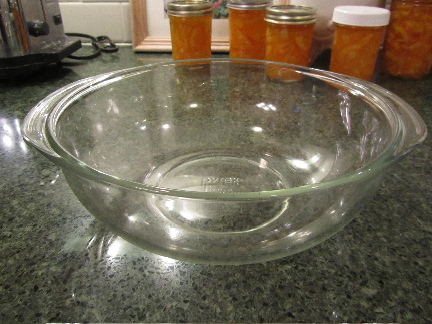 "I used a 1 1/2 litre pudding basin. 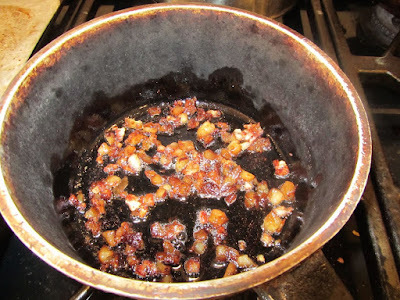 Grease the basin and put fruit jelly or marmalade or choc sauce in the bottom of the basin, a couple of tablespoons. Weigh two large eggs and mix with the same weight of flour ( I use self raising, but you can use flour with no raising agents and add in a teaspoon of baking powder instead), butter/margarine and sugar. This can flavoured how you wish. If you can make a cake in that flavour then you can make a pudding in that flavour. 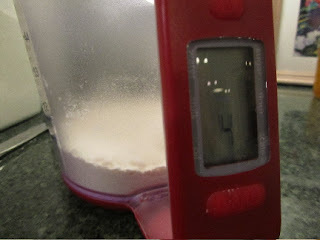 Cover the basin with microwaveable film, pierce it a few times and cook on high. I have a 900W machine and it cooks for 4 minutes in that. Leave to stand for a minute and then eat with custard or cream or ice cream. 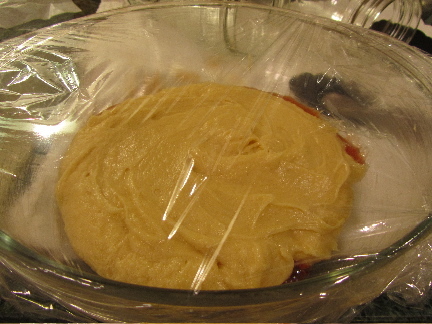 My family likes raspberry jelly with vanilla sponge, lemon curd with a citrus sponge and a chocolate version of course.The pounds and ounces version is 2 eggs, 4 ounces of butter, 4 ounces of caster/fine sugar and 4 ounces of self raising flour. Mix and cook as above." I have a measuring cup that weighs in ounce and grams. I was able to fill to the correct amount of ounces, then scoop into standard US measuring scoops. I included the metric equivalents, as they were easy to add in. I found the recipe very easy to put together, and with very ordinary ingredients, a huge plus for a recipe in my book. I just want to say a big thank you to Diane, for taking the time to come back to the comments and add this recipe for us and anexactinglife. And just so you, who may be reading this, know, I love trying new recipes, and figuring out how to convert. Just a very odd quirk of mine. When I made this, I used a 2-quart, round, microwaveable casserole dish. If you have a 1&1/2 litre pudding basin, that is what Diane recommended. Having done this once, next time I'll try a straight-sided souffle baker. I think it will come out prettier, being taller and with straight sides. Grease pudding basin or casserole dish. 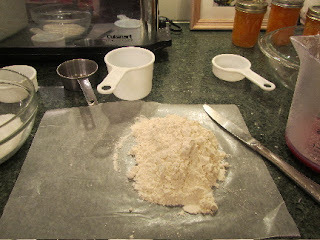 You can also substitute a scant cup of self-rising flour for the all-purpose flour, baking powder and salt. For a chocolate sponge pudding, reduce flour by 2 tablespoons, and add about 1/4 cup of cocoa powder to the flour mixture. Spoon into greased pudding dish, 2 tablespoons jelly, marmalade or chocolate sauce. 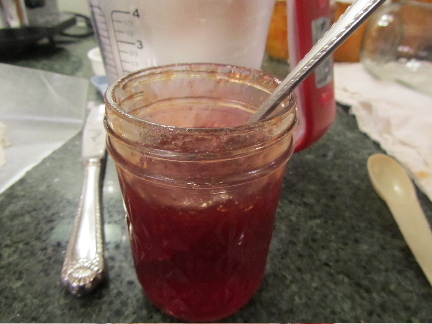 If jelly is very firm, stir it up with a spoon first. You want to cover the bottom of the dish, this will help in releasing the pudding once it's cooked. Combine flour, baking powder and salt in a small bowl. (Add cocoa powder if making chocolate sponge). Set aside. 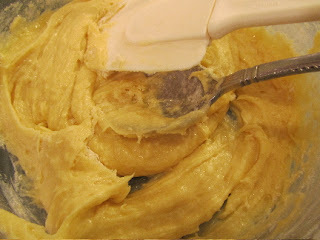 In a mixing bowl, cream butter with sugar, beat in eggs. Add vanilla extract. Stir in flour mixture until combined. Cover with a sheet of plastic wrap. Pierce plastic wrap in several places. Microwave on HI for 3 1/2 minutes to 4 minutes (I'm not sure what the wattage is on my microwave, may be 1000 W, but the vanilla pudding was just slightly over-cooked in 4 minutes even. Next time I'll try it in 3 min. 45 seconds; chocolate pudding you may want to shorten the cooking time by 15 seconds or so, as chocolate desserts scorch easily). Allow to stand, covered in microwave for 1 minute. Remove to cooling rack, and carefully peel off plastic wrap. Allow to cool for 5 minutes. With a flexible spatula, loosen the edges of the pudding. Place a plate over the dish, and invert pudding, using the spatula to aid in loosening the pudding. Serve while still warm, with custard, cream or ice cream. We had ours with whipped cream, as that was easy for me. It was quite delicious, and super easy. I'm looking forward to trying a chocolate version. I have baked cakes in the microwave before, but not for a long time. Maybe it's time to give it a try again with this recipe. I'm going to start with chocolate and ice cream. We enjoyed the vanilla version (I even got up in the night to have another sliver). I think I over-cooked it, just by a few seconds. I'll continue working on how to tell when it's done. I'm going to try a chocolate version this week. I think that will be a huge hit with my family. Hope you like it. Do you make your neat balls or buy them? I have a great recipe for a vital gluten "turkey" that my family loves. I make them with beans, bread crumbs, egg, minced onion, garlic and herbs. Gluten "turkey", that sounds interesting. I used to make something we called wheat meat. It was wheat gluten, baked in a patty, then run through the food processor to make into small bits, and then egg and seasonings added. I would form these into patties, bake again, then serve with a gravy over, like salisbury steak. How do you get your gluten to taste like turkey? And do you begin with whole wheat flour? Or do you start with a gluten substance? My recipe had me make a dough of whole wheat flour, then wash out the starch to get the gluten. I'll post the details on my blog. It really isn't hard. You can either start with wheat or with a packet of gluten. Last time I made it I started with a packet of gluten. The neat balls sound good. Will have to try them out. Also hope Belinda can find her recipe. Be cool to try it. 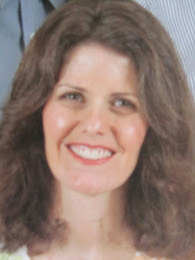 Great Shara! I look forward to your recipe. Belinda, that sounds really yummy. I sure hope you can find the recipe, and share. I'd love to try it. This is my lucky day! Thanks to you and Diane for posting the pudding recipe. Mr. Exacting will be very pleased! I can't wait to try it.